Pope Francis recently signed a pact with Muslims in a possible push toward a one-world religion and declared that diversity of religions is God’s will. But wait. Doesn’t the Bible warn Christians about unifying with those who worship other gods and have contradictory beliefs? But the prophet Muhammad was a violent warrior who promoted conquest, had multiple wives, and killed Jews and Christians – referring to them as infidels and sworn enemies. Look it up. Jesus was a sinless, spiritual leader who laid down His life to save mankind, said “Father, forgive them” to those that crucified Him’ Jesus never killed anyone. Muhammad too, was a spiritual leader, who became a political leader, a liar, and a violent military leader. Christ ruled by peace while Muhammad ruled largely by the sword. The pope and the grand imam of al-Azhar signed what was referred to as “a historic declaration of fraternity, calling for peace between nations, religions and races, in front of a global audience of religious leaders from Christianity, Islam, Judaism and other faiths.” Many gods and spirits exist, but if one religion is true, all the rest have to be false. Does the Bible have anything to say about this? Though there are some similarities, Islam is quite incompatible with the Bible as well as America, a society that values Judeo-Christian principles and religious freedom. Islam will accept no other religions, no competing economic or political views, and no legal system except Sharia Law which would outlaw Christianity. And by the way, did you know Muslims elected to Congress demand to be sworn in on the Quran, not the Bible? So who or what are they swearing allegiance to? Many passages in Islamic holy books command and justify violence in the name of Allah. Let’s look at what the Quran has to say about other religions. The Quran contains at least 109 verses that speak of war with nonbelievers, usually meaning non-Muslims, as well as 164 verses declaring jihad, holy war. Religion of peace – really? Islam is a social, political and economic system (Sharia Law) that uses a false deity (Allah) to advance its agenda of control. The meaning of Islam is “submission,” and people must bow to Allah. The God of the Bible, Jesus Christ said, “All authority has been given to me (Matthew 28:18).” Islam, however, teaches Jesus was only a prophet. They say He was not God and teach that Jesus did not sacrifice Himself for our sins and die on the cross, nor did He rise from the dead. But these are core essentials of the Christian faith! Muhammed claimed to be the last and greatest of all of God’s prophets, he had fifteen wives, and sanctioned the beating of wives (Sura 4:34). Muhammed was well known for spreading his new religion by force. Five years after his death, Muhammad’s followers captured Jerusalem and by 732 A.D. they went into Spain. Their aggression continued for hundreds of years until finally, resistance rose up via the Crusades which began in 1095. Back to Pope Francis: another thing he did was to declare the Sharia-governed United Arab Emirates the ‘homeland of tolerance.’ Just look at history and news reports and you’ll see this could not be further from the truth. Clearly, Islam and Christianity are mutually exclusive. Both claim to be the only true way to God, but both cannot be right. Islam is advancing in the West with an evil agenda to convert Westerners and especially Americans to Islam and dominate the world. If that happens, the biggest loser will be the church of Jesus Christ in the West because of its loss of its religious liberty and freedom of speech. Nowhere in the Bible does God encourage joining with other religions. 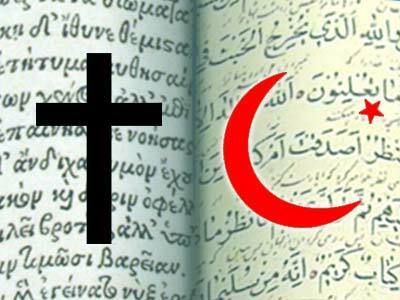 While there have been many attempts in recent years to find common ground between the two religions, the fact is that stark differences remain. It is misguided to focus on a few common teachings without considering the differences in major doctrines that are diametrically opposed to one another. This is not to say we shouldn’t evangelize people of other faiths, but when it comes to “uniting,” Christians are often the first to compromise, and it’s often biblical doctrine that suffers. All through the New Testament, we read about salvation by faith in Christ alone; that we are saved by the grace of God through trusting in the sacrifice of Jesus (Eph. 2:8-9). We know that powerful, world elites are pushing uniformity and a one world religion, but it’s still stunning to see top world leaders from Catholicism and Islam make such a dramatic display. This is clearly a sign we’re drawing closer to the end.